Indiana is a U.S. state located in the midwestern and Great Lakes regions of North America. 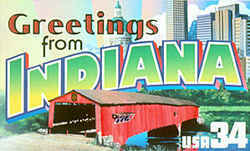 Indiana is the 38th largest by area and the 16th most populous of the 50 United States. 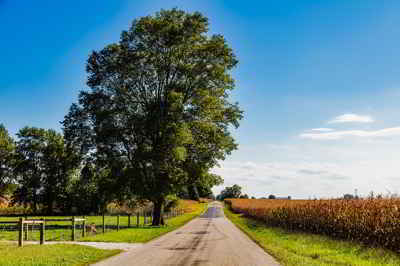 Indiana is the least extensive state in the contiguous United States west of the Appalachian Mountains. Indiana is bordered on the north by Michigan, on the east by Ohio, and on the west by Illinois, while Lake Michigan borders Indiana on the northwest and the Ohio River separates Indiana from Kentucky on the south. The state's name means "Land of the Indians", or simply "Indian Land". The state's name means "Land of the Indians", or simply "Indian Land". It also stems from Indiana's territorial history. On May 7, 1800, the United States Congress passed legislation to divide the Northwest Territory into two areas and named the western section the Indiana Territory. In 1816, when Congress passed an Enabling Act to begin the process of establishing statehood for Indiana, a part of this territorial land became the geographic area for the new state. On January 8, 1833 is when it was officially became the Hoosier State. For well over a century and a half the people of Indiana have been called Hoosiers. It is one of the oldest of state nicknames and has had a wider acceptance than most. True, there are Buckeyes of Ohio, the Suckers of Illinois and the Tarheels of North Carolina - but none of these has had the popular usage accorded Hoosier. The only comparable term in American experience is Yankee. And that started out as a synonym for New Englander. In the Civil War era Southerners applied it indiscriminately to all Northerners. In the world wars, many a boy from Dixie doubtless felt a sense of shock when he discovered that in the eyes of our British (Limey) allies that all Americans were Yanks! But where did Hoosier come from? What is its origin? We know that it came into general usage in the 1830s. John Finley of Richmond wrote a poem, "The Hoosier's Nest," which was used as the "Carrier's Address" of the Indianapolis Journal, Jan. 1, 1833. It was widely copied throughout the country and even abroad. Finley originally wrote Hoosier as "Hoosher." Apparently the poet felt that it was sufficiently familiar to be understandable to his readers. A few days later, on January 8, 1833, at the Jackson Day dinner at Indianapolis, John W. Davis offered "The Hoosher State of Indiana" as a toast. And in August, former Indiana governor James B. Ray announced that he intended to publish a newspaper, The Hoosier, at Greencastle, Indiana. A few instances of the earlier written use of Hoosier have been found. The word appears in the "Carrier's Address" of the Indiana Democrat on January 3, 1832. G. L. Murdock wrote on February 11, 1831, in a letter to General John Tipton, "Our Boat will [be] named the Indiana Hoosier." In a publication printed in 1860, Recollections . . . of the Wabash Valley, Sandford Cox quotes a diary which he dates July 14, 1827, "There is a Yankee trick for you - done up by a Hoosier." One can only wonder how long before this Hoosier was used orally. Whatever may have been the original acceptation of Hooshier this we know, that the people to whom it is now applied, are amongst the bravest, most intelligent, most enterprising, most magnanimous, and most democratic of the Great West, and should we ever feel disposed to quit the state in which we are now sojourning, our own noble Ohio, it will be to enroll ourselves as adopted citizens in the land of the "Hooshier." When a visitor hailed a pioneer cabin in Indiana or knocked upon its door, the settler would respond, "Who's yere?" And from this frequent response Indiana became the "Who's yere" or Hoosier state. No one ever explained why this was more typical of Indiana than of Illinois or Ohio. That Indiana river men were so spectacularly successful in trouncing or "hushing" their adversaries in the brawling that was then common that they became known as "hushers," and eventually Hoosiers. There was once a contractor named Hoosier employed on the Louisville and Portland Canal who preferred to hire laborers from Indiana. They were called "Hoosier's men" and eventually all Indianans were called Hoosiers. A theory attributed to Gov. Joseph Wright derived Hoosier from an Indian word for corn, "hoosa." Indiana flat boatmen taking corn or maize to New Orleans came to be known as "hoosa men" or Hoosiers. Unfortunately for this theory, a search of Indian vocabularies by a careful student of linguistics failed to reveal any such word for corn. Quite as plausible as these was the facetious explanation offered by "The Hoosier Poet," James Whitcomb Riley. He claimed that Hoosier originated in the pugnacious habits of our early settlers. They were enthusiastic and vicious fighters who gouged, scratched and bit off noses and ears. This was so common an occurrence that a settler coming into a tavern the morning after a fight and seeing an ear on the floor would touch it with his toe and casually ask, "Whose ear?" The distinguished Hoosier writer, Meredith Nicholson (The Hoosiers) and many others have inquired into the origin of Hoosier. But by all odds the most serious student of the matter was Jacob Piatt Dunn, Jr., Indiana historian and longtime secretary of the Indiana Historical Society. Dunn noted that "hoosier" was frequently used in many parts of the South in the 19th century for woodsmen or rough hill people. He traced the word back to "hoozer," in the Cumberland dialect of England. This derives from the Anglo-Saxon word "hoo" meaning high or hill. In the Cumberland dialect, the word "hoozer" meant anything unusually large, presumably like a hill. It is not hard to see how this word was attached to a hill dweller or highlander. Immigrants from Cumberland, England, settled in the southern mountains (Cumberland Mountains, Cumberland River, Cumberland Gap, etc.). Their descendents brought the name with them when they settled in the hills of southern Indiana. As Meredith Nicholson observed: "The origin of the term 'Hoosier' is not known with certainty." But certain it is that . . . Hoosiers bear their nickname proudly. Many generations of Hoosier achievement have endowed the term with connotations that are strong and friendly . . . .
A resident of Indiana is known as a Hoosier. The etymology of this word is disputed, but the leading theory, as advanced by the Indiana Historical Bureau and the Indiana Historical Society, has "Hoosier" originating from Virginia, the Carolinas, and Tennessee (a part of the upland South region of the United States) as a term for a backwoodsman, a rough countryman, or a country bumpkin.